GoPro's upcoming camera mount will use six six Hero4 cameras to shot VR content. GoPro is developing a mount that can hold six of its cameras, a product aimed at the small but growing number of people who want to shoot video and photos for virtual reality headsets. On stage at the Code conference, CEO Nick Woodman introduced GoPro's first Six-Camera Spherical Array, a ball-shaped mount for Hero4 cameras. The new array, slated to ship this year, will leverage video and photo stitching technology from Kolor, the virtual reality software company that GoPro acquired in April. Woodman said GoPro has been interested in developing equipment for shooting VR video for some time, but decided to do it now because investments from big players, including Facebook, Google and Microsoft, point to a promising future for VR, according to a Recode article. At the same time, Woodman reportedly acknowledged during his Code appearance on Wednesday that cheaper setups are needed for mass adoption. 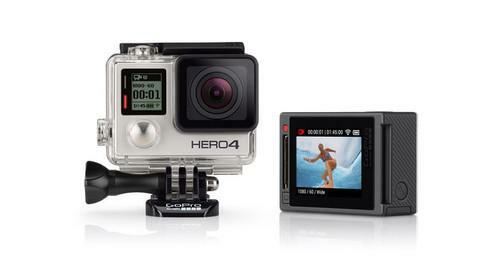 Six GoPro Hero4 Silver cameras cost about US$2,400, not counting the cost of the mount. Several companies are developing spherical cameras for shooting VR videos and or images, including Bublcam, 360fly and Panono, but none of them is yet available. There are also existing mounts from companies such as 360Heros that can be used to create content for the Oculus Rift, the Gear VR from Samsung Electronics and Google's Cardboard. GoPro's announcement is further proof the pieces are slowly falling into place for the VR headset market. HTC plans to ship before the end of the year its Vive headset, which uses Valve's SteamVR platform, while Facebook's Oculus Rift is due in 2016's first quarter. Other products such as the Gear VR and Cardboard are already available. To succeed, these VR headsets will need good games and videos. One of best games currently available for Gear VR is HeroBound, which was created by Oculus CTO John Carmack, Samsung said last week. It's only a matter of time until big video game developers start creating virtual reality editions of their most popular games, according to Samsung, which believes the availability of VR cameras for consumers will also help the market take off. Woodman also said GoPro plans to ship a quad-copter drone in the first half of next year.